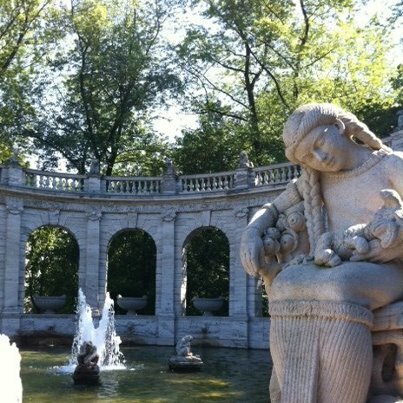 When I think of summer in Berlin, one of the first things that comes to mind is the fairy tale fountain, gateway to the lush Volkspark Friedrichshain. It is lined with stoney sculptures from the Brother Grimm's folk tales; Little Red Riding Hood, Cinderella, and Sleeping Beauty, all sitting side by side. When I came here last summer, it was an especially hot day, and some children were bathing in the knee-deep water of the fountain. I took in this magical scene, and my heart ached a bit. For I was living far away, in Los Angeles, and this magical fountain in the middle of leafy Berlin became a symbol of so many things that I missed deeply. In a couple of months, I am returning to Berlin, this time with my little family, and I can't wait to come back here with little N, sitting on the edge of the fountain, marveling at the fairies all around us, and waiting until the sun is warm enough so that we can dangle our feet in the water.